Haryana Chief Minister Bhupinder Singh Hooda today urged the Centre to reverse the norms set for procurement of bajra to the pre-2009 period with immediate effect. He was speaking at the 56th meeting of the National Development Council at Vigyan Bhawan in New Delhi today. Farmers in the Gohana Anaj Mandi today heaved a sigh of relief after their five-day agitation when the government agency, HAFED, started purchase of their bajra produce today. In a drive to check the use of nicotine powder at hookah bars and lounges - the latest fad among youth - authorities of the Food and Drug Administration in Haryana recently conducted raids at various points located in four districts of the state. Governor Jagannath Pahadia today praised the sports policy of the Haryana government terming it as one of the best sports policies in the country. He was addressing the annual day function of Motilal Nehru School of Sports, Rai. He announced a grant of Rs 1 lakh for student welfare. The police has arrested three persons for bid to supply a mobile phone and some recharge coupons in the district jail here yesterday. There seems to be no immediate respite from unscheduled power cuts for people in most parts of Haryana. Despite the claims made by the government regarding improvement in power supply, residents continue to reel under unscheduled cuts throughout the day. Non-teaching employees of Haryana Agricultural University exchanged fisticuffs at a meeting of the HAU Non-teaching Employees Association (HAUNTEA) here last evening. The authorities have fixed sites for stalls for the sale of crackers at Fatehabad, Tohana, Ratia, Bhattu, Bhuna and Jakhal towns of this district on Diwali. Haryana Cooperation and Housing Minister Satpal Sangwan said the government was committed to providing one-room houses to BPL families in the Housing Board localities in the urban areas as well as in the villages. The police has arrested accused of Kasni firing incident wherein a woman along with some other persons opened a fire on her mother-in-law and brother-in-law after barging into their house at Kasni village here on Tuesday. 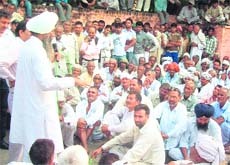 Hooda said that in the current kharif bajra procurement season, problems have cropped up and farmers were feeling agitated. Before 2009, the Food Corporation of India used to take over all bajra stocks procured by state agencies. However in 2009, the Government of India revised the norms for procurement. These norms have been made so stringent and non-workable that not even a gram can be procured. This has been a setback for the cultivation of bajra in rainfed areas, thereby adversely affecting small and marginal farmers. He also stressed on the need to revamp the teacher education set-up and suggested that the 12th Plan must come up with a Centrally funded scheme to set up teacher education institutions with a credible regulatory mechanism. They also opened the locks of main gates of the mandi after getting an assurance from the ADC that their entire produce would be purchased by the government at the MSP. A team of district officials, including ADC Pushpender Singh, SDM Gohana Satyavan Indora and DRO Suresh Kumar, today reached the mandi and held discussions with the agitating farmers. Finally, the ADC assured the farmers that their entire produce would be purchased. Gurnam Singh, BKU state president, also reached the spot and assured full support to the demands of the farmers. The government was not purchasing their bajra due to varied reasons, including wetness and quality, and the farmers had been agitating for the past five days in support of their demand for purchase of bajra by the government agency. The places where the raids were conducted by the department in the past few days included Panchkula, Gurgaon, Rohtak, Bahadurgarh (Jhajjar), Panipat, Hisar and Bhiwani. As many as 14 samples were taken of the substance being used for smoking. It was found that nicotine powder was being used instead of the traditional tobacco that is consumed through the hookah in the rural and semi-urban areas of the state. The hookah bars have been charging Rs 150 to 250 per hour from each member. Nicotine is a drug and anyone offering such a service on a commercial basis has to get a licence from the Drug Controller Department. None of the 14 hookah bars raided possess such a licence. Sources at the department said no manufacturer of the product served at hookah bars had a drug manufacturing licence that is mandatory under Section 18 C of the Drugs and Cosmetics Act, 1940. GL Singhal, Deputy Drug Controller, admitted that samples had been taken after the raids. He claimed that teenage boys and girls, mostly school and college students, were members of hookah bars. Sukhbir Kataria, Minister of State for Sports, said that with determined efforts, the state government had updated and revised its sports policy twice in the past two years. RP Chander, Financial Commissioner and Principal Secretary, Sports and Youth Welfare Department listed the incentives and facilities being provided by the state government for the promotion of sports activities. VK Verma, Principal and Director of MNSS, gave an account of the sports activities of the school. Later, the Governor distributed prizes among the students. Drills and cultural items were also presented. The accused, Gian Chand (35), Surinder (32) and Raj Kumar (34), were arrested after a jail warden found a mobile phone in a parcel for a murder convict, Nathu Ram, lodged in the jail here. The mobile phone was hidden beneath slippers, which were brought by them for Nathu Ram. However, the jail warden noticed the mobile phone and informed the matter to his seniors, who intimated the matter to the police. The jail authorities handed over the trio to the police and a case under the Prisons Act, 1984, was registered against them. Residents in most cities, especially in Yamunanagar and Panipat, complained that power supply continued to be erratic throughout the day. “We get electricity for two hours followed by an hour of power cut. Even when there is no power cut, frequent voltage fluctuations make it difficult for us to run any electrical appliances,” rued Munit Ganganagar, a resident of Panipat. Its not just the urban domestic consumer who is braving these unscheduled power cuts. Industrial consumers said that they were suffering because of erratic power supply and unscheduled cuts, making it difficult for them to operate their high-power-consuming machines. Even in rural areas, power supply remained far from satisfactory. In most villages, people are just getting four to five hours of power. Sources in the state power utilities informed The Tribune that there was a shortfall of almost 110 lakh units of power today. Against a demand of almost 1,100 lakh units, the total power available in Haryana was 990 lakh units today. “As a result of this gap in demand and supply, we have had to impose some cuts. Also, the power situation has become better today as the 600 MW unit at Kheddar has become functional after the fault there was repaired. “Only one of our units at Yamunanagar (300 MW) is not operational because of a snag. However, not only has the demand for power fallen because of fall in temperature, but we have also started getting 250 MW power from NTPC through Aravalli Power,” said a senior official. It is learnt that the state is not making any short-term power purchases or trading power at the power exchange. But with the fall in frequency on the northern grid and the subsequent drop in unscheduled interchange rates for overdrawing power, Haryana today overdrew about 35 lakh units of power from the grid to bridge the gap in demand and supply. The newly elected office bearers of HAUNTEA were sworn in first. Thereafter, the annual accounts statement was tabled. A few members objected that the accounts of the Ministerial Staff Association, which had merged with HAUNTEA, had not been included in the statement. This led to an uproar. Former HAUNTEA chief Dharamvir Shastri went up the stage to explain. However, he was prevented from doing so by some employees. Later, several members exchanged fisticuffs. In the melee, one member fell off the stage. This was stated by Haryana Vidhan Sabha Speaker Kuldeep Sharma, addressing the inaugural function of a zonal youth festival of the Sonepat zone here in GVM Girls College. He said that even President Obama and Hillary Clinton of the US had praised Indian youngsters for their academic brilliance. In her welcome address, college Principal Dr Jyoti Juneja said that students of 19 colleges from Sonepat and Jhajjar districts were participating in this three-day festival. Jagbir Rathi, director of youth welfare, MDU Rohtak, enumerated the youth welfare activities of the university. In his orders issued here today, District Magistrate Vijay Singh Dahiya has appointed six duty magistrates, one each for the six towns, for ensuring that crackers are sold only at the sites specified by the authorities. Mela Ground located opposite the mini-secretariat has been selected for installing stalls at Fatehabad town. Open ground of HUDA at Bhattu, Sports Stadium opposite bus stand at Bhuna, open ground opposite Nam Charcha Ghar at Ratia, open ground at Damkaura Road at Tohana and Government Senior Secondary School ground at Jakhal have been selected for the purpose of selling crackers. The authorities have been issuing temporary licences for the sale of crackers. 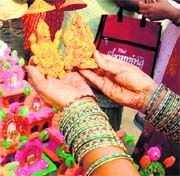 Dahiya said only those who had licences would be allowed to set up their stalls at the sites allotted for this purpose. The cracker dealers would not use oil lamps or gas lamps for the purpose of lighting and they would use only electric supply to avoid any risk of accidents. The DC has appointed tehsildar Naurang Dass as duty magistrate at Fatehabad, tehsildar Vijender Bhardwaj at Tohana, tehsildar Darshan Kumar at Ratia, tehsildar Bhup Singh at Bhuna, tehsildar Krishan Kumar at Bhattu and tehsildar Balor Singh has been appointed duty magistrate at Jakhal. Meanwhile, two persons have been arrested on the charge of hoarding crackers illegally in a residential colony in Panipat. Acting on a tip-off, the police raided a general store in Jawahar Colony in the tehsil camp area of the city, from where it seized crackers worth over Rs 1 lakh brought from Rohtak. Sangwan said 1,266 houses, including 864 in Sector 60, 213 in Sector 8 and 189 in Sector 19 of Sonepat, were being constructed for BPL families. Such houses could be constructed in the villages also if land was provided to the Housing Board. When asked about the reports of a shortage and blackmarketing of DAP fertilizer, the minister admitted that there could be some instances of blackmarketing. But the government acted swiftly and carried out the checking of stocks, he said, certain premises were raided in Ratia after complaints of hoarding of DAP fertilizer were received. “There is no shortage of fertilizer and sufficient stock is available with HAFED and other agencies,” he said, adding that the district authorities had been directed to keep a vigil on any kind of hoarding or blackmarketing. About the problems being faced by farmers in procurement of bajra by the government agencies, he said there were some technical problems regarding grading the produce. “However, I will bring it to the notice of Chief Minister Bhupinder Singh Hooda for reconsideration of the technical aspects of the procurement process,” he added. Three country-made pistols, some cartridges and a car has been seized. Devender Dangi, Jhajjar Police’s PRO, said those arrested were Sujata, Sandeep, Deepak and Amit.